THIS ADORABLE VICTORIAN HOME HAS BEEN PROFESSIONALLY REHABBED FROM THE ROOF TO THE FLOORS. THERE'S A FULL BEDROOM AND BA ON THE FIRST LEVEL. TWO WAYS TO GO UPSTAIRS. ALL UPGRADED LIGHTS, THREE GORGEOUS ELECTRIC FIREPLACES: ONE IN FORMAL LIVING ROOM, ONE IN DINING ROOM, AND ONE IN MASTER BEDROOMS WITH REMOTE FOR MASTER.GOURMET KITCHEN WITH CUSTOM CABINETS, GRANITE COUNTER TOPS, STAINLESS STEEL APPLIANCES, STATE OF THE ART REFRIGERATOR THAT HAS AN ICE MAKER, WATER DISPENSER, AD HOT WATER DISPENSER ON THE DOOR! ALL THREE BATHROOMS WERE COMPLETELY REDONE. CERAMIC SHOWERS IN ALL BATHROOMS. ENJOY THE LONG SUN PORCH ALONG WITH THE DECK ON THE BACK OF THE HOME. DETACHED GARAGE WITH 4-6 CARS CAN BE PARKED IN DRIVE WAY. INDEPENDENTLY APPRAISED FOR $239,900. INSTANT EQUITY! 2 MASTER BEDROOMS ONE DOWNSTAIRS AND ONE UPSTAIRS. Ready to visit 215 Webster? Request a free property tour! 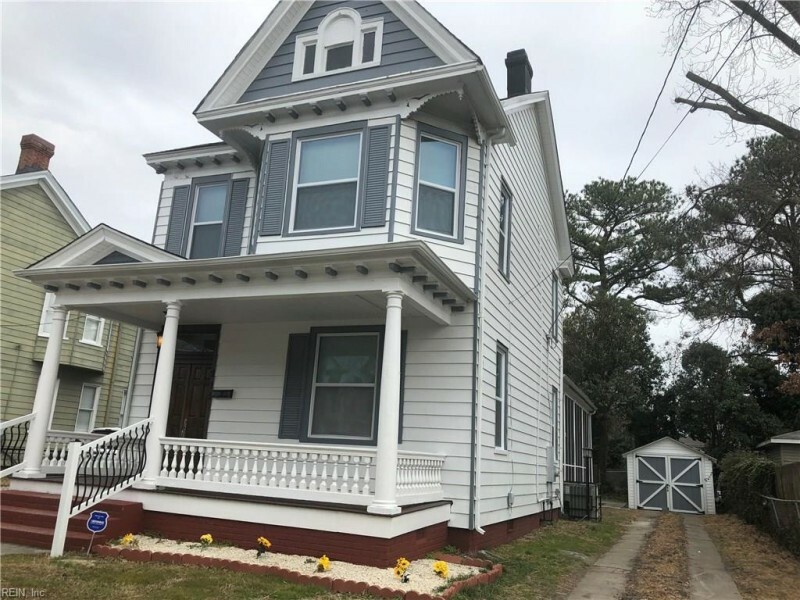 Send me more information about the listing at 215 Webster, Portsmouth, VA 23704, MLS# 10239347. This 4 bedroom, 3 bathroom home located at 215 Webster, Portsmouth, VA 23704 has approximately 2,400 square feet. It is currently listed for $229,900 and has a price per sqft of $9,579. This home is currently Active under the MLS#: 10239347. This listing is provided by 757 Realty. 215 Webster Avenue, Portsmouth was built in 1905. It has Garage Det 1 Car, 4 Space, Driveway Spc parking.The kitchen includes Dishwasher, Disposal, Dryer Hookup, Elec Range, Refrigerator, Washer Hookup. 215 Webster is part of the Park View - 039 neighborhood located in 23704.